Sometime around the end of February, the millionth solar installation came on-line in the United States -- a milestone that says as much about where the solar industry is going as it does about how far the industry has come. At the end of 2015, the U.S. solar market hit a total capacity of 27 gigawatts. That represents just 1 percent of the current U.S. electricity mix, but it could triple to 3 percent by 2020. 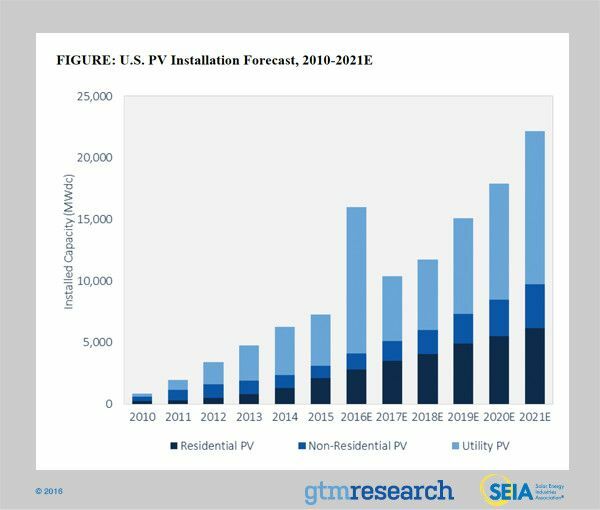 This year alone, the U.S. solar market is projected to grow 119 percent, which represents an additional 16 gigawatts of new installed capacity and more than double the record-breaking 7.3 gigawatts added in 2015. Over the coming weeks, SEIA will run a campaign called #MillionSolarStrong to raise awareness around the U.S. solar industry’s achievements to date. The campaign includes a social media “thunderclap” and a flagship event in Washington, D.C. on May 3. Indeed, solar has become impossible to ignore. A recent report from ICF International found that U.S. generators stand to lose as much as $2 billion in revenue by 2019 as solar generation grows and demand for conventionally generated power declines. In response to the rising number of solar homes, system operators around the country are now working on plans to turn distributed solar into a grid asset. The solar industry has benefited greatly from favorable policies such as state renewable energy mandates and the federal Investment Tax Credit (ITC), which will continue to drive growth over the next five years. At the same time, technology advancements will continue to reduce costs, making solar more competitive. In addition, if natural-gas prices rise from historic lows, the relative financial outlook for solar will become even more attractive. It’s not yet known when exactly the millionth installation came on-line -- the number-crunchers at GTM Research and the SEIA are still working to figure that out. But it is possible to give a reasonable estimate. At the end of 2015, there were a little over 960,000 solar installations around the country, with slightly under 90,000 installations occurring in the fourth quarter of 2015. Assuming installs have continued at a similar pace of between 25,000 and 30,000 per month (the new year tends to be slightly slower due to winter weather), the millionth solar system very likely came on-line by early March. The tally includes solar projects of all sizes. So while rooftop solar projects make up the majority of installations in the U.S., utility-owned projects make up the lion’s share of U.S. solar capacity and continue to see strong growth. "Utility-scale solar is central to the larger solar market, and that's not going to change," said Whitten. The millionth solar installation could have been a utility project. Perhaps it was the Avalon 2, Tucson Electric Power’s 27-megawatt project in Arizona that was connected in late February. Or it could have been a project in the small but expanding commercial segment, such as Intel’s 6.5-megawatt solar carport project in California that was connected on February 16 and is believed to be the largest solar project of its kind. Because of the sheer number of residential projects, however, there’s a good chance the millionth installation was on the roof of a home. Bill Allman, whose system came on-line in January, said he’s proud to be one of the million installations. Allman bought his 52 solar panels through the cooperative MD SUN. By grouping with other buyers, he was able to sign a deal that will pay off the system in five to seven years, and then it will be making money from that point on. Going solar also brought attention to how things like efficient light bulbs help to lower a home’s overall energy consumption and carbon footprint, he said. Bob McCoole also wanted to go solar to be a good environmental steward, but when he applied for approval from the city of Clayton, Missouri, his request was initially denied. The Clayton Architectural Review Board has an ordinance that says solar panels cannot be visible from the street. McCoole appealed the staff’s decision before the city council, making the case that his proposed array wouldn't be seen from the front of the house; only the edge would be seen from the side. After a long discussion on precedents and ordinances, the city council ultimately overruled the staff’s recommendation and allowed the project to proceed. Perhaps more importantly than approving this one project, the board indicated that they need to revisit their aging rules for rooftop solar. Local-level hurdles are one of the factors holding back solar project deployments. So as solar becomes more accepted and ordinances are updated, installers’ bureaucratic costs will drop, overall project costs will drop, and even more installations are likely to come on-line. Since the implementation of the federal Investment Tax Credit in 2006, solar installation costs have dropped by more than 73 percent. Continued cost reductions are key to reaching the next solar milestone. For McCoole, the decision to buy solar wasn’t about the potential money savings. Based on current electricity rates, he expects it will take 10 to 12 years to earn a payback on his $30,000 system. That’s not the case for everyone, however. Dorothy Riley, who benefits from a portion of a community solar project in Colorado, said going solar was all about the financial benefit. Riley, who is 75 and in a lower income bracket, said solar has reduced her electricity bill by roughly a third. “It has helped me a lot, and I’m really grateful for it,” she said. “It gives me a little more money to pay some of my other bills.” Riley said she’ll have her mortgage paid off in four years thanks in part to solar. Riley received a portion of the solar installation last May through a program offered by Grid Alternatives in Grand Valley Power territory. These types of lower-income solar initiatives rely on donations, and thus become easier to deploy as equipment costs fall and new business models emerge. Kelly Schwarze, a filmmaker and SolarCity customer in Nevada, might actually have the millionth U.S. solar installation. His leased system came on-line in the first week of March, but in a few more months, any financial benefits he sees from going solar could disappear. 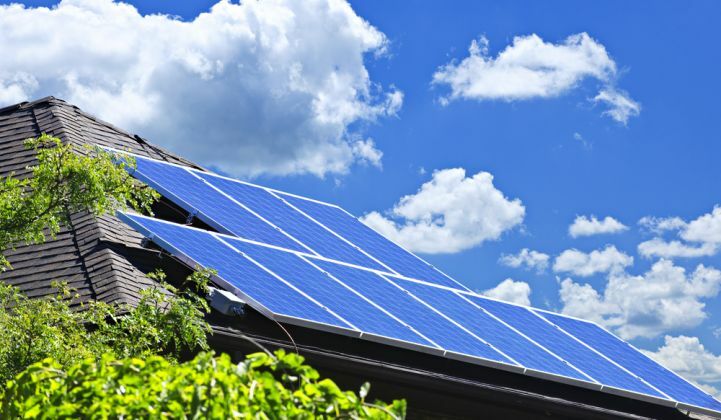 Earlier this year, the Nevada Public Utilities Commission approved a new rate plan for both new and existing rooftop solar customers that reduces net-metering compensation and increases fixed fees over 12 years. While the total number of U.S. solar installations continues to grow, Nevada’s residential market has ground to a halt. Schwarze had already signed a contract to go solar before the new rates took effect. Now he’s waiting to see how his investment will be affected, and holding out hope that the governor’s newly appointed energy task force comes up with a more equitable solution. For Schwarze, the fact that there are now a million solar installations is a testament to the fact that many Americans want to go solar and will fight to make good choices for the environment and their pocketbooks.